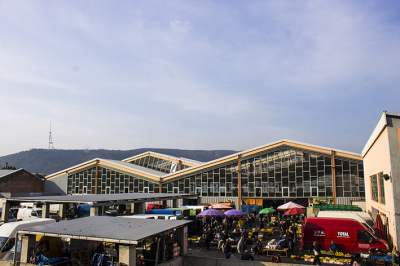 Dezerters bazaar is located in the center of the city and operates as an agricultural market. “On that place during soviet times was constructed agricultural market which served long time for citizens and was very popular with its good quality. 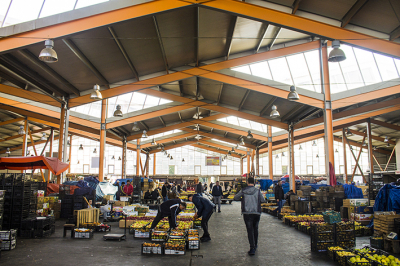 After demolition in 2007 place was empty and became parking for tracks with imported agricultural goods and time by time transformed in street wholesale market. Such development of place was not acceptable as for government as for owner as well, since it except visual side was cleanness as well and was decision to construct new market. Place itself is in old part of the city and development in this area is quite densely. Our aim was to create simple building and fit it in the city center on the historically known place for market. One of the main issues to solve was logistic of a tracks and intersection of wholesale and retail market user, parking and movement of clients, since in the area is busy traffic. Our solution followed up, we divided territory in tree parts, front yard which serves as wholesale for local and imported agricultural goods. Where tracks can access directly from main road and leave same way. Yard directly connects to ground floor of a main building which stands in the middle of the plot. Ground floor is partly used also as a whole sale, also as a storage for different kind of products, to keep them during all seasons. Main buildings first floor is used as a retail market with connection to ground floor for better provisioning of a fresh products. Access to retail market is with side road from where is direct access to tree floor parking, located in the end of a plot, parking’s first floor is not covered but is located on the same level as retail market, what makes it pretty comfortable. After solving technological part of functionality we decide to create simple shaped partly open building. 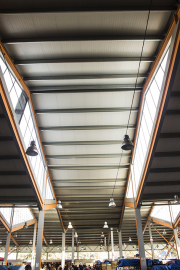 Not to get boring building we played with roof structure, since there’s a retail market space on the first floor and lot of day light is needed, decision was made to knot sloped rood and with natural lighting we got very interesting ceiling for retail space with size of approximately 5000sq/m. this roof had another benefit too, it worked as a fifth façade because of a location. Place where project is located is one of the lowest in town and from several places around citizens can see it quite well, so it even fits better from above views since it repeats shape of roofs located around. One of the interesting details is a stair case from the side, which as a name of a project we decided to leave from previous project located on that place. This long stairs was a part of a history also and it goes parallel to side road used for retail market clients.